Last week we mentioned the IMDb app being updated with more ways to share quotes from movies, a must have to be amongst the well spoken at the water cooler. 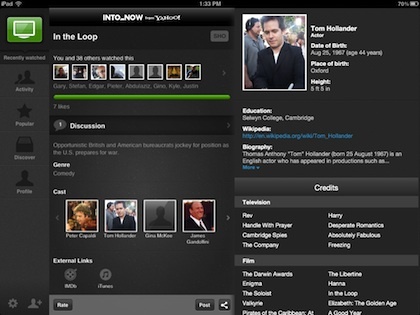 Today, IntoNow has also updated their app to give you more info, quicker, all with your iPad. The Universal app IntoNow has been out a while. Now shown as from Yahoo, will listen to a TV show or Movie and tell you about it. Then, to keep your whole life social, you can share with others that you are watching the show. Friends and strangers can share their watching history. With the update this weekend, more info about the TV show or Movie is available right away. 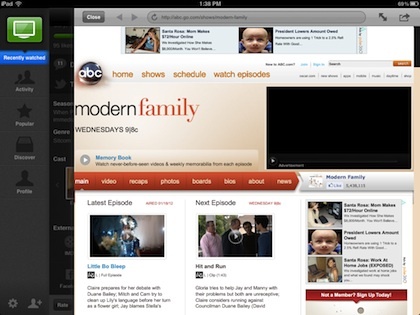 When watching a show, launch the app and tap the big green screen button for IntoNow to listen to the show. Based on the digital signature of the show, you will get a result showing you who else is or has watched the show, who is in the show and discussions about it. Tapping any of the information shown will expand that information through a window on the right. Swiping these will close or expand. Tap a person in the show results in more info on that actor and other shows they ave been in. 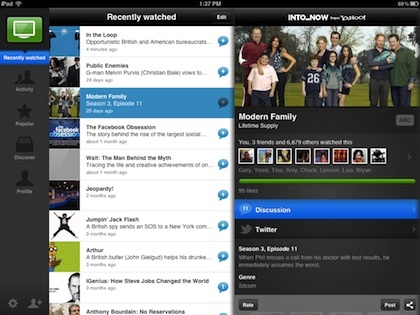 The options along the left of the IntoNow app will show you what you and others have watched before, particulars about previously ‘liked’ shows as well will tell you things you may like to watch. Choosing a show that you watched earlier or that someone else flagged will result in the same info that you would view if the show was live. 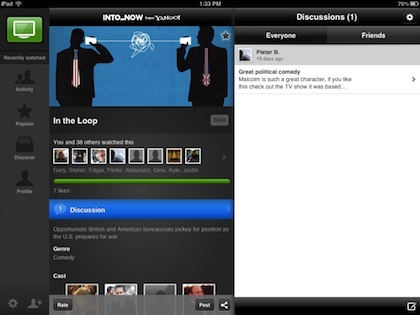 IntoNow shows you who else flagged the show, reviews, discussions, more info on the actors and ‘links’. The links shown below center/low on the page are short cuts to info on IMDb, the show’s site and Wikipedia. Also, if the show is available on iTunes or HuluPlus. Tapping their logo will take you to view the show on those services. ‘Official’ is a link to open a site related to the show your looking at. 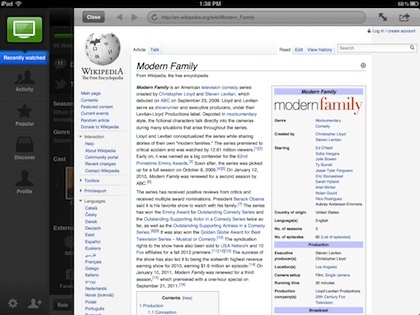 Wikipedia is always a handy source for more info, where there is a page available for the show, IntoNow offers a button that opens the page within the app.